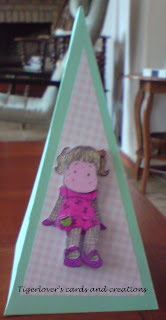 Tigerlover's cards and creations: CRAFT Challenge 10, colour combo limegreen and pink. DT call for CRAFT Challenge blog still open. 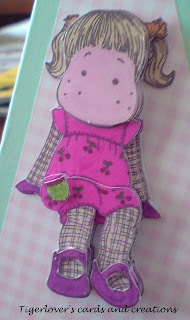 CRAFT Challenge 10, colour combo limegreen and pink. DT call for CRAFT Challenge blog still open. Hi everyone, hope you are all well. It's time for challenge 10 at CRAFT Challenge already and this week we want you to create something with the colour combo limegreen and pink. Below you can find my daughter's entry as part of the DT. Just one very important message regarding this challenge: this one is running for 2 weeks due to holiday of Claire and will therefore be running till the 6th of August, entries are due in before Wednesday the 5th of August at 8pm. 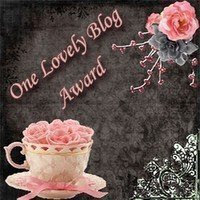 You are also still able to apply for the 2 DT posts until then, just put a link to your blog or on line gallery (like trimcraft eg) in the posts and we will come to have a look. 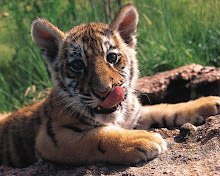 Hubby and I took the kids, including Tigerlover, to their grandparents (my in-laws) for the coming 2 weeks. 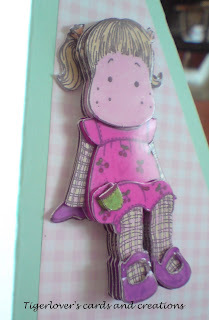 As she already managed to colour in a Magnolia stamp over the week, which she wanted me to scan, print and decoupage cut for her, we took some of the stuff with us for the weekend. Also gave me a chance to work on my card as well. She really loved the triangle design of last week's CRAFT Challenge card, so she asked me to cut the shape out for her again in a limegreen card. She also wanted some pink tartan paper cut to fit. So, on Saturday afternoon after arriving at my in-laws she quickly put together the cut image and the card. Hope you like it, I think she's quite proud of it (rightly so I think). As she is currently and her grandparents, she will have to miss challenge 11 and possibly 12 of CRAFT Challenge, hope you will understand.